“The drum is the pulse of life.” That’s the declaration insisted by Fela Kuti in the vibrantly fresh and hypnotically cool Afrojazz musical that explores the pioneering legacy of the Nigerian entertainer. Fela! was one of the recent offerings I witnessed in a bold, life-like screening as produced by the prestigious National Theatre in London. Their NT Live series, just like the Met Opera in New York City, captures live theatrical performances in HD format and beams it live by satellite to movie theaters across the UK and the US. Or depending on which theater you choose to see it, the screening is saved on the cinema’s hard drive and is presented in an encore showing. The infectious musical touches on the active life of Fela Anikulapo-Kuti and his one-night concert event at the Shrine, his famed nightclub that adds luster to his legendary status. On this particular night, the show-within-the-show framework reveals to the audience that it would be Fela’s final night at the club. They better live it up or he’ll send his exotically slinky female dancers for a tease. In addition to being an influential political activist, Fela used his trademark music to convey his status as the resistance to the Nigerian governmental oppression. Music and dance is his key communicator. Just like his chorus of agile and hip-shaking dancers, it all just flows out so seductively. The score’s musical hybrid of jazz, funk and African rhythm and harmonies as performed by the crack jazz ensemble literally emanates from off the stage, or in this case, off the screen. Sahr Ngaujah, magnetic presence he is, plays Fela with true immensity and empowerment. As if you were seeing the real-life Fela before you conducting the proceedings, the utter conviction in creating a master performance becomes so personal. It’s all right there being channeled by Ngaujah. Fela’s spiritually haunting mother, Funmilayo Kuti, also plays a part in the moral conscience of Fela’s mind. As played by Melanie Marshall, her reverberant vocals hypnotize and add shades of musical grounding in between bursts of African drumming and horn swelling. 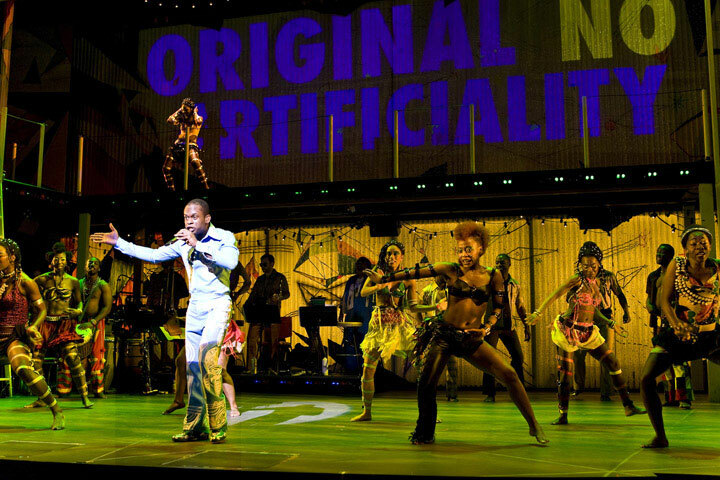 Although the show is thin on plot and contains long stretches of fluttering dance interludes, Fela! remains a vibe-heavy experience filled with unique and contemporary devices only seen in groundbreaking musicals. Spring Awakening, Passing Strange and Next To Normal can now join Fela! in this small, but growing list. Director and choreographer Bill T. Jones has conceived his show as an entertaining tribute to Fela’s life and legacy. Even if you are not aware of the biographical backstory, you will still come away appreciative of being in the company of Fela and his farewell concert at the Shrine. ‘Spider-Man’ Musical the Worst Show on Broadway?